Lawn mowers that run on internal combustion engines burn gasoline as fuel, and like any engine with metal parts, your lawn mower requires oil to lubricate the pistons and other moving parts. The oil reduces friction between moving metal parts and protects the life of your engine. But unlike an automobile or many other larger engines, in a lawn mower there are two ways that engine oil can be delivered. Lawn mower engines come in two different basic designs: two-stroke engines and four-stroke engines. In a two-stroke engine, the complete combustion cycle of gasoline vapors being compressed, ignited, and exhausted is completed in just one back and form movement of the piston: A compression stroke in which the piston squeezed the gas vapor happens at the same time the spark ignites the mixture; during the return stroke of the piston, the exhaust gases are let out of the piston, and fresh fuel vapor mixture enters the cylinder. Two-stroke engines require that you mix the oil right in with the gasoline; there is not oil crankcase to fill or maintain. During the first stroke, the intake stroke, an air-fuel mixture is drawn into the engine cylinder. The second stroke, known as the compression stroke, the piston compresses the fuel-air mixture; at the point of full compression, the spark plug ignites the mixture in the cylinder. The third stroke is the power stroke, in which the exploding fuel mixture powers the piston down to the bottom of the cylinder. The fourth stroke is the exhaust stroke, in which the piston moves back inside the piston to the same position as the ignition stroke, but this time valves open up to allow exhaust fumes to exit the cylinder. Four-stroke engines require a reservoir for engine oil to lubricate the connecting rods and other engine parts. Pound for pound, two-stroke engines have more power than four-stroke engines, since there is a power stroke on every revolution of the engine. They can, therefore, be lighter than four-stroke engines to deliver the same amount of power. However, four-stroke engines are gradually becoming more popular, due largely to the fact that two-stroke engines burn a small amount of oil inside the cylinders with each ignition revolution. In interests of minimizing pollution emissions, manufacturers are gradually shifting to four-stroke engine designs. Therefore, checking, adding, and changing oil is done only on a four-stroke lawn mower engine. With two-stroke engines, providing motor lubrication is done by properly mixing two-stroke oil with the gasoline used to run the mower. Four-stroke lawn mower engines come in several variations. Simple, inexpensive mowers may not even have a dipstick to check the oil level; you just need to eyeball the level in the crankcase when you remove the filling plug. Elaborate, expensive lawnmowers or riding mowers may more closely resemble motorcycle engines, complete with oil-level dipstick and oil filters. Check your manufacturer's owner manual to learn the details of how to check oil levels and how to add or change the oil in the crankcase. You have to be very careful when filling an engine with oil, whether in the process of changing the oil altogether or simply adding oil. Unfortunately, getting the level wrong (whether it be too much or too little) can have seriously bad consequences. The engine can overheat, causing damage to the piston and cylinder walls. The engine can seize up, since there is no longer any lubrication between the parts. An engine that seizes will require serious rebuilding, and there's a chance it can't be saved at all. But over-filling the engine can also cause problems. The excess oil has to go somewhere. It will inevitably end up seeping into parts where it does not belong, potentially causing them to malfunction. It is best to check the level of the oil in the engine before you start the lawn mower before each use, while the engine is still cool. If you check it after use, make sure to let the engine cool down completely to avoid accidentally touching the engine and burning yourself. When checking the oil, make sure your machine is on level ground; you will get a false reading if the machine is not level. If the oil level is fine and the oil appears clean and dark amber in color, you can go ahead and mow the lawn; your engine oil is fine. 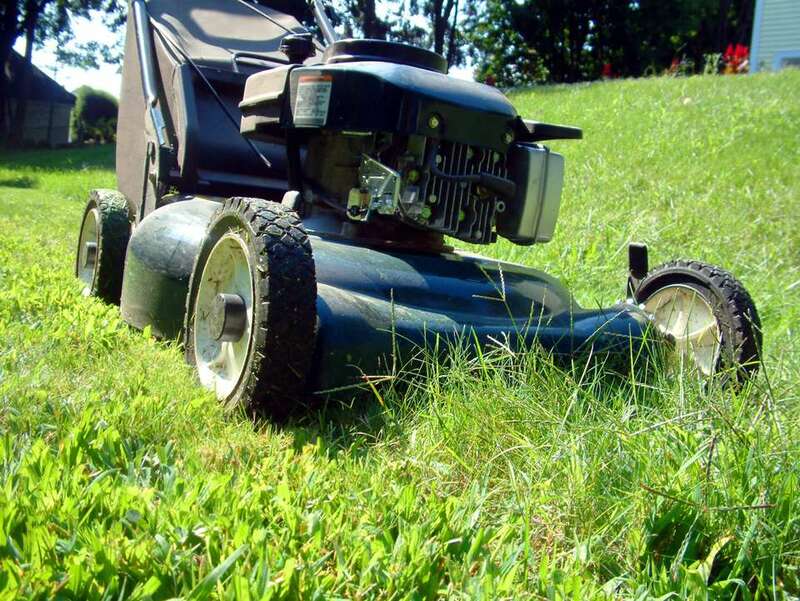 If the oil appears clean but the reading is low, add oil before mowing. If your lawn mower's oil appears dirty, it's time to change the oil. It's fine to mow the lawn first before doing this maintenance, since warm oil will drain out of the lawn mower much more easily. If the motor oil level is low, add a small amount of oil to the crankcase before mowing, then change the oil after you finish. To add oil to the crankcase with a low oil level, insert the nozzle of a funnel into the fill opening, then pour a small amount of SAE 30 motor oil (or whatever is recommended by the manufacturer) into the lawn mower's crankcase. Take care not to overfill the crankcase, since over-filling can also cause problems. When filling your lawn mower engine with oil, pour in just a little bit at a time, then re-check the level. You are more likely to make a mistake if you are rushing through this maintenance task. Use only a type of oil suitable for your lawn mower (check the manual when in doubt). Screw the fill plug back into the crankcase. You are now ready to mower your lawn. Check your mower engine before every use. Especially as lawn mower engines grow old, they may begin to leak slightly and "burn oil" as they operate. Changing the oil in a lawn mower engine should be done annually, as a minimum. And if you use the mower heavily or if it is quite old, you may need to change it more often. The best rule of thumb is to regularly inspect the quality of the oil on the dipstick, and change the oil whenever it appears black and soiled rather than semi-transparent and dark amber in color. New lawn mowers should get an oil change fairly early. Some manufacturers recommend an oil change after the first 5 hours of use. After this, change the oil after every 50 hours of use, or before the start of each mowing season. Cover your work area with newspapers or cardboard. With smaller mowers, it may be easiest to put the mower up on a workbench to change the oil, or you can work on a garage floor or driveway covered with newspaper or cardboard. With large riding mowers, you may need ramps to elevate the mower so you can get at the drain plug below the mower. Make sure you have an oil pan to catch the oil as you drain it out of the crankcase. Start up the mower and let it warm up for about 1 minute. This will warm up the oil slightly and make it drain out more easily. Shut off the mower, then disconnect the spark plug wire from spark plug. Use rags to wipe away the area around the fill plug and drain plug areas. For push mowers, prop up the mower so the spark plug is facing upward. This will prevent gasoline from draining out of the machine. Place an oil pan under the mower. Use a socket wrench to unscrew the oil drain plug in a clockwise direction. Allow the oil to drain out into an oil pan.Replace the drain plug into the drain opening, making sure it is tight. Transfer the old oil into a container you can seal for proper disposal. Never pour used motor oil onto the ground or down a drain Any retailer that sells motor oil is equipped to dispose of old oil—just take your container of used motor oil to a filling station or oil-change outlet. In lawn mowers equipped with oil filters, you may need to change the oil less frequently, since the filter will catch large particles of dirt and debris. But the filter should be changed at least once each year, or whenever the manufacturer recommends it. Locate the oil filter, and remove it by twisting the cartridge counter-clockwise until it screws loose. Often you can do this by hand, but a filter wrench can make this easier. Carefully wipe off the metal rim where the oil filter seals against the engine. Examine the rubber seal on the new oil filter. If it is dirty at all, wipe it clean, then wipe a thin layer of oil onto the rubber seal. Thread the new filter onto the engine and tighten it by hand until the rubber seal slightly compresses against the metal rim of the filter mount. Tighten the filter slightly more, using a filter wrench. Remove the oil fill plug on the mower. (Some mowers may have two plugs; either one can be used to fill the crankcase.) Insert the tip of a funnel into the fill opening, and slower pour fresh motor oil into the engine crankcase. Use only the amount of oil recommended by the manufacturer, and avoid overfilling. As the level nears the full amount, use the filler plug dipstick to check the oil level. Make sure to wipe the filler stick clean before each check. When the crankcase is full, screw the filler plug back into the fill opening, and wipe up any oil that has spilled on the floor or lawn mower chassis. Reconnect the spark plug wire. Your lawn mower oil is now changed, and you're ready to mow. Make sure to check the oil level and the condition of the oil before every use. Keeping your engine full of clean oil and maintained at the proper levels is perhaps the most important thing you can do to keep a lawn mower operating efficiently for many years. Lawn mower maintenance for two-cycle engines is quite another matter altogether. Lubrication for two-stroke engines (also called two-cycle) is achieved by mixing the recommended oil into the fuel. Thus, with two-stroke engines, there is no oil to check with a dipstick, because the fuel and the oil are mixed together. The only checking comes in making sure that you are using the recommended type of oil and using it in the recommended ratio. Follow the manufacturer's recommendation on what type of oil to use and the recommended ratios. And make sure to mix the oil and gas thoroughly. As in every other area of life, lawn mower maintenance is now being assisted by computer technology. For some high-end mowers, such as the Cub Cadet RZT-L, there is already a Bluetooth app you can download onto your phone to remind you when it is time to change the oil and air filters, and to perform other tasks related to tuning up your mower and keeping it in good working order. These apps keep track of the hours of use on the mower engine and will alert you when its time to perform maintenance tasks. Some apps can even be used to order replacement parts online.